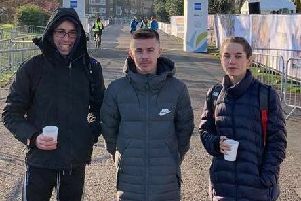 Two of Hastings Athletic Club’s top young distance running talents achieved top 10 finishes at the English Schools’ Championships. George Pool came ninth in the intermediate boys’ 3,000m at the Alexander Stadium in Birmingham with a personal best time of eight minutes and 49 seconds. Lizzie Clarke was 10th in the senior girls’ 3,000m with a new personal best and under-20 club record of nine minutes and 56 seconds. It was the first time that Clarke had gone under 10 minutes and she was awarded a national badge for doing so. Clarke, who went from the gun and dragged everyone along, was running for Kent Schools and Kent’s senior girls won the team prize. Most of the girls who finished ahead of Clarke were a year older than her and she is determined to finish even higher next year. Two adult Hastings AC distance runners, meanwhile, were successful at the 9th Romney Marsh 10K in New Romney on Sunday. Rhys Boorman was second overall in a personal best time of 33 minutes and 20 seconds - just eight seconds behind winner Marshall Smith (Ashford AC). Sophie McGoldrick did extremely well to be the leading lady in 47:02. St Leonards-based Ross Skelton, of the Brighton Phoenix club, came 10th in the British 10K in London on Sunday with a time of 31 minutes and seven seconds.